Festive update: we strung up some lights and added the mini wreath I made with Lily and Adrianna the other night at Rolling Greens to the mix! I've been "polluting" as Moses puts it, the new Google Home Moses got for his birthday from my mom like it's my job. However, I'd hardly call it pollution though--all I've been saying is,"Okay Google, play Mariah Carey's Christmas Album" and such. In fact, I'd actually call it spreading Christmas cheer. :D Meanwhile, Vienna's been hunting around the house, trying to sniff out her holiday treats, and should be feeling super lucky that I didn't pick up a Christmas sweater for her this year. And since today marks the midway mark to Christmas, ahhh don't freak, that wasn't supposed to be a scary statement, I thought I'd bake up something extra holiday spicey! I'm not really sure how this all came about, but somehow Molly, Steph, Michelle, Lily, and I decided that cake toast should be, can be, and is, a thing. A glorious thing in fact! So today we're all sharing our renditions on what cake toast is to us. The beauty of cake toast is that there are no rules, or not really anyway. All you need is cake, it could be a loaf, or simply a slice, and whatever toppings your heart desires. Lily made grapefruit and earl grey cake toast (gahhh, it's so pretty), Michelle made yellow cake toast (yummm, I'll take two), Steph made angel food cake toast (cute, light, fluffffffy, and so much nom), and Molly made ras el hanout loaf cake toast with yogurt and sesame sprinkles! 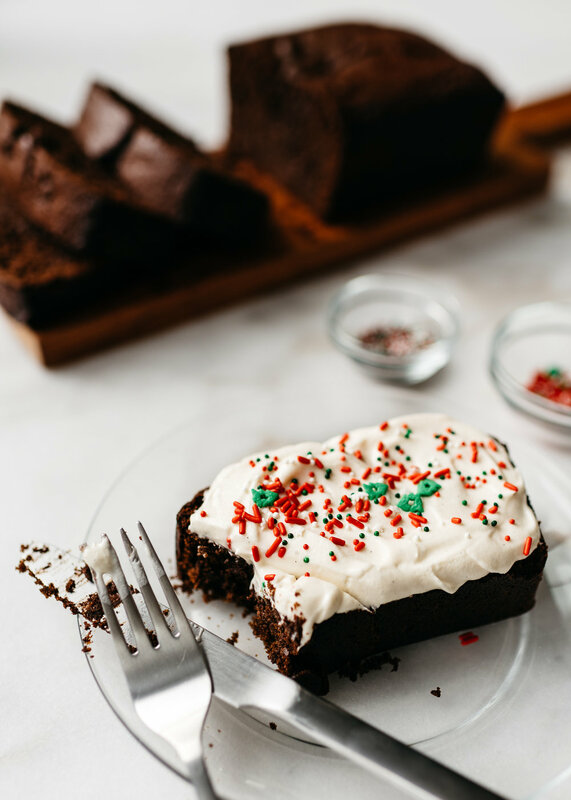 And then to really round it all out, I went the festive route and turned my chocolate gingerbread loaf into cake toast by slathering some good old fashioned cream cheese frosting on it. Pretty sure between the five of us, we've got a cake toast option you might be into. Happy halfway to Christmas and cake toast day!! Preheat oven to 350°F. Line a 9 x 5-inch loaf pan with parchment paper, making sure there's overhang on both of the long side. Grease shorter sides with cooking spray or butter and set pan aside. In a medium mixing bowl, whisk together the flour, cocoa powder, baking soda, salt, ginger, cinnamon, allspice, cloves, nutmeg, and pepper and set aside. In the bowl of a stand mixer, fitted with a paddle attachment, beat butter and sugar together on medium-high speed for 2-3 minutes or until light and fluffy. Adjust speed to medium-low and add vanilla. Once incorporated, add eggs, one at a time, beating well after each, and scraping down sides as necessary. Next add molasses and beat until throughly incorporated. Reduce speed to low and add buttermilk and flour mixture in three parts each, alternating between wet and dry. Remove bowl from mixer and fold in chocolate chips. Transfer to the prepared pan and bake for 50-60 minutes or until a toothpick inserted into the middle of the cake comes out clean. Transfer to a wire rack to cool in pan for 10 minutes then remove from pan, using parchment wings, and let cool completely. Slice into thick 1-inch slices, lightly toast, and top with desired toast toppings (see notes below for a quick cream cheese frosting). Serve and enjoy! Notes: For a quick cream cheese frosting, cream 8 ounces of room temperature cream cheese with 4 tablespoons of room temperature unsalted butter together in a stand mixer, fitted with a paddle attachment. Add 1 cup of powdered sugar and beat on medium-low, increasing speed as sugar is incorporated, until light and smooth. Add 1 teaspoon of vanilla extract and beat until fully combined.